"This is a modified version of the Betty Crocker® vegan sugar cookies. I am not vegan but this recipe is the best I have used for avoiding egg and dairy (for allergy purposes). I serve these cookies all the time to non-vegans and they are always a huge hit. The key is to not over bake! Please note, each individual ingredient is not necessarily certified vegan. Decorate as you wish with your preferred cookie icing." Combine confectioners' sugar, shortening, and white sugar in a large bowl; beat with an electric mixer until smooth. Add coconut milk, water, egg replacer, vanilla extract, and almond extract; beat on medium speed until combined. Stir flour, cornstarch, and cream of tartar together in a separate bowl. Beat into shortening mixture until combined. Cover and refrigerate dough until firm, at least 3 hours. Preheat oven to 400 degrees F (200 degrees C). Line 2 baking sheets with parchment paper. Divide dough into small portions. Roll out to 1/4-inch thickness on a generously floured surface. 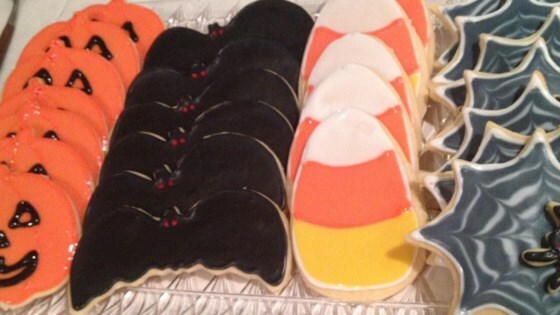 Cut into desired shapes with 2-inch cookie cutters. Place cookies about 2 inches apart on the prepared baking sheets. Refrigerate for 15 minutes. Bake in the preheated oven until set, 10 to 12 minutes. It's best to underbake; baking until golden will yield cracker-like cookies. Cookies will puff while baking and then settle when done. This recipe is for rolled and cut cookies. Drop cookies will require longer baking time. If you're using a different brand egg replacer, use the indicated amount to replace 1 egg.